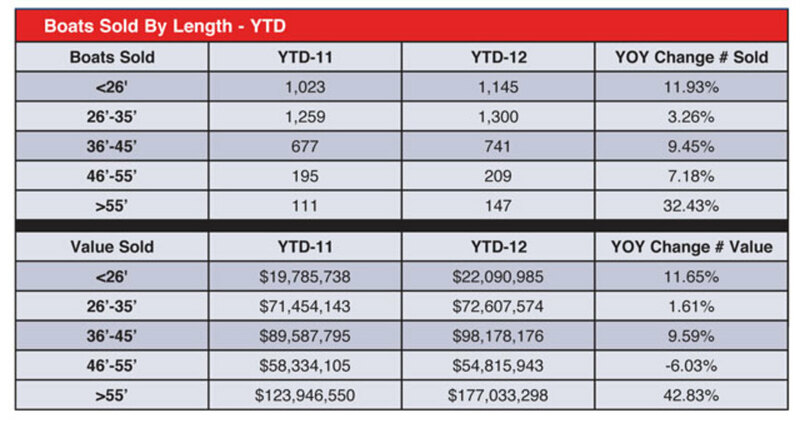 In February, for the second month in a row, YachtWorld.com member yacht brokerages reported better sales than in 2011, not only among bigger boats, but also among smaller and medium-size boats. The number of boats sold was up 12.6 percent, to 1,908, from February 2011 and the total value of the boats sold was $231 million, a 25 percent increase. For the year to date, $424.7 million has been paid for 3,542 boats. That’s a 17 percent increase in total value from the first two months of 2011 and an 8.5 percent increase in sales. Sales in each month in the second half of 2011 were generally flat or down slightly from their 2010 pace, so starting the new year with a mini-rally indicates a possible shift in the wind for the brokerage market. Brokers have to look back to 2008 to find the last time they sold 3,500 boats in January and February. Generating greater volume and beating the five-year average for brokerage sales (see chart) requires selling more boats under 35 feet. Sales of boats under 26 feet have risen 12 percent so far this year, to 1,145. The 26- to 35-foot category has increased only 3.3 percent, but with 1,300 boats sold it represents the largest segment of the market. In the 36- to 45-foot segment, sales are up 9.5 percent, to 741. As often happened in 2011, however, the largest boats also have sold well this year, compared with the previous year, and for significant prices. Among boats over 55 feet, 147 transactions have taken place, a 32.4 percent increase. The total value of those sales has increased 42.8 percent, to $177 million. For the second month in a row, sailboats sold well, marking a 17.7 percent increase from 2011, as 359 boats changed hands. However, the aggregate value of the boats sold was down 23.6 percent on $23.7 million in sales. Although powerboat volume increased only 11.5 percent, the 1,549 boats sold for an aggregate $207.3 million, up 34.8 percent from the same month a year earlier. The superyacht market of boats over 80 feet also had an impact on the totals recorded in February. Sixteen boats of that size were sold, a number equal to or greater than all but two months in 2011. The 29 boats sold for the year to date have fetched an aggregate $90 million, a 93 percent increase from the same period in 2011, when 18 boats were sold. The average selling price of a superyacht was reported as $3.11 million, a 20 percent increase from $2.6 million a year earlier.